This is part 2 of a 2 part series. If you missed my first post you can read about it HERE. As I said in my last post, Miracle-Gro is on a mission to simplify gardening for a whole new class of gardeners and show that it can be easy, fun and enjoyable! When choosing a project for this post I wanted something that was going to be super simple to show you all that gardening can be very enjoyable without taking up a lot of your time. I found an old bread box at a garage sale a while back. At the time I didn't know what I wanted to do with it but I knew I could turn it into something amazing. 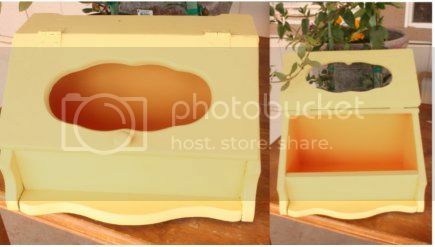 I removed the broken glass and gave the box a fresh coat of bright yellow and orange paint. Once the prep work was done, the only thing left for my guests to do was fill the box with dirt and add the flowers. The first step for this project was to remove the broken glass. I would only suggest removing the glass if it in broken. Otherwise I would leave the glass in. Next, paint your bread box in the colors of your choice. You do not need to paint all of the inside since it will be mostly covered with dirt. Now comes the fun part. Hand out some little shovels or scoops and tell your guests to dig in. Fill the box a little more than 1/2 full of Moisture Control Potting Mix. 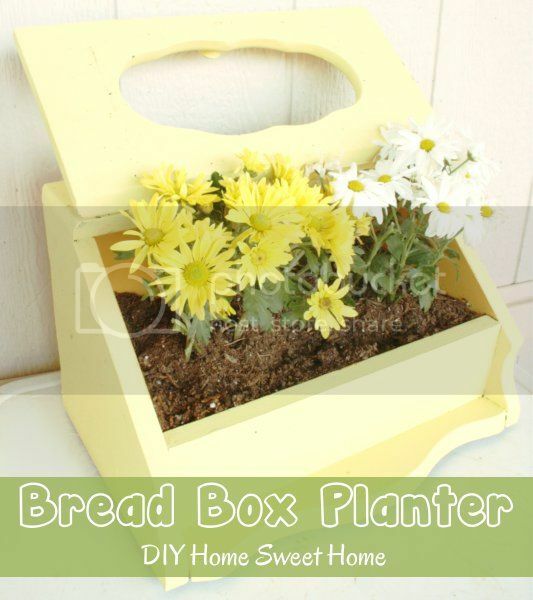 Remove your plants from their pots and arrange them inside your bread box. Add some more potting mix around the plants if needed. Give the flowers a good watering and your done!! I think the best part about this project was that the girls got to spend some quality time with their Grandma and Great Grandma who they have not seen in a year. We have been having a heat wave here lately (It's been well over 100* for the past 2 weeks) so unfortunately no one wanted to be outside for long. However, at the same time, that's what made this project so perfect. Not counting the prep work (painting and removing the broken glass) the project only took about 10 minutes to complete. I love it!! It adds such a beautiful pop of color to the back patio. “Follow” the Miracle-Gro Pinterest page for more fun garden projects. Visit Miracle-Gro online to view an abundance of articles and videos full of expert gardening tips for beginners as well as professionals. Also be sure to check out their online tools to help you solve any of your common garden problems and find the right products to maintain a healthy and beautiful garden. Watch this fun video to get you inspired and create your own gardening story. Thank you for the article! It was so cute that I shared this link to one of my google + communities. Thanks again. This is such a fun idea! I just have to pin it.